Gonzalo Rodriguez Diaz grew up in Uruguay with his Spanish family. His introduction to wine came at an early age, when he was put in charge of opening the wines at his family’s weekly barbecue, under the watchful eye of his grandfather, a bon viveur who lived by the motto: “wine is life”. His introduction to fine dining came equally early in life, as his grandfather used to take him to restaurants, where he remembers ordering the same food as the adults, and was occasionally allowed to try a sip of their wine. Rodriguez Diaz cut his teeth in the catering industry in San Sebastián, in northern Spain, when he was 17. The region’s proximity to Rioja gave him the perfect excuse to take off for a few days and explore the vineyards, which ignited his passion for wine. Today, this passion has “evolved into an obsession, and an unquenchable thirst for knowledge”, says Rodriguez Diaz, who takes every chance he can to visit the world’s wine regions. His wine journey in the UK began in 2013 at River Café alumnus Theo Randall’s eponymous restaurant at The InterContinental hotel on Park Lane, where he worked as a supervisor, moving on to the role of sommelier at Thackeray’s restaurant in Tunbridge Wells a year later. 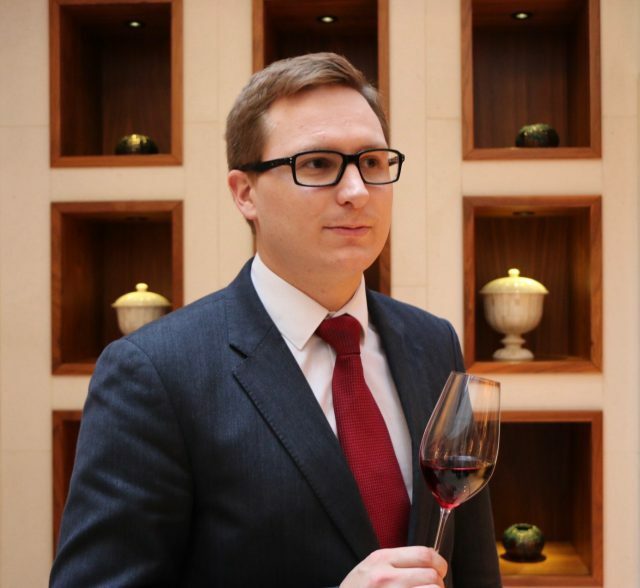 His big wine break came in 2016 when he was appointed head sommelier and wine buyer at St James’s Hotel and Club. Nestled in the boutique hotel is art-strewn Michelin-starred restaurant Seven Park Place. Catering to only 26 covers spread across nine tables, Rodriguez Diaz is in charge of the restaurant’s 104-page ‘wine book’, filled with 1,100 drops, including some of the finest wines known to humanity, all of which can be delivered to the bedrooms of hotel guests via room service. As well as his beloved Spain, and adored Nebbiolo, Burgundy holds a special place in Rodriguez Diaz’s heart, and his passion for Pinot is reflected in his list, which includes the likes of Vosne Romanée Les Gaudichot.